Bob Hoye’s Pivotal Events, published every Thursday, is consistently one of the most insightful and well-written newsletters in the financial world — a great read that could be compared in quality only to Grant’s Interest Rate Observer. Bob’s latest dispatch suggests that the banking sector is one of several key areas of the U.S. economy that could lead the next major stock-market decline. If so, the chart of the Bank Stock Index provides good reason for investors to worry. 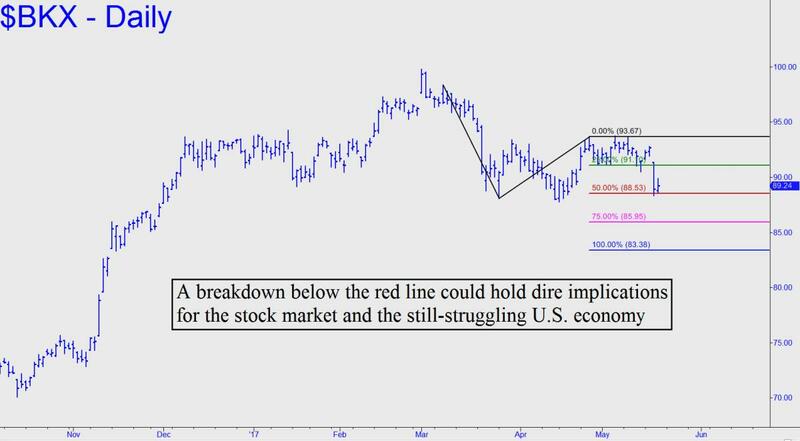 The index ended Thursday sitting at 89.24 (see inset), just above the 88 threshold that Bob regards as a crucial support. From a Hidden Pivot standpoint, it would be speculative to conclude that a breakdown is inevitable. In fact, the bounce from the 88.53 midpoint pivot shown in the chart could be interpreted as a sign that the bull is healthy because the correction has stalled, and possibly is reversing, after having gotten only halfway to the 83.38 correction target. However, it would take a very powerful rally surpassing 97.07 to confirm this. That seems extremely unlikely to occur, especially with the housing and auto sectors already rolling over. Far more probable in my estimation is that BKX will soon fall decisively below the midpoint pivot. That would indicate more downside to at least 83.38, at which point we might conclude that it is game…set…match not only for the bull market, but for the still-struggling U.S. economic recovery.